Welsh-Ryan Arena, Northwestern Athletics will take the next step in our pursuit to capture Big Ten titles, compete nationally and provide a world-class experience for our student-athletes and fans. To achieve these goals, we need to increase our financial support. Over the past five years, the additional resources from Wildcat Fund donors have made a profound impact on our success and now is the time to invest further in these programs. All donations for seating or parking locations must be allocated to the WILDCAT EXCELLENCE FUND. Donation are annual commitments and must be renewed each year. Only one Wildcat Excellence Fund annual donation is expected. If you are already a member, you do not need to make an additional gift unless you desire seats that require a higher donation. Your one Wildcat Excellence Fund gift covers any donation requirements for BOTH basketball and football parking and season tickets. 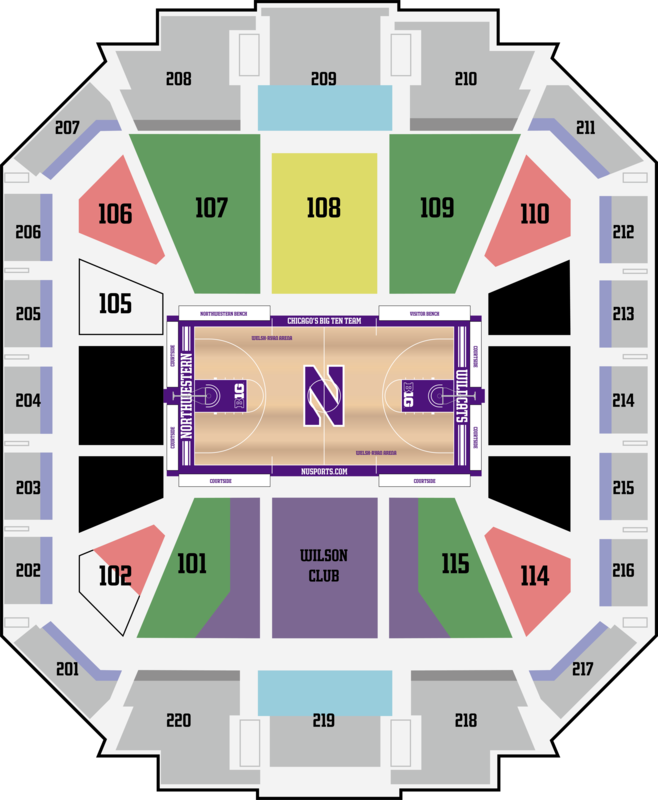 * Club and Courtside ticket prices include a $1,200 hospitality fee that covers complimentary food and beverage costs in the Wilson Club. The Wildcat Excellence Fund is our unrestricted annual fund which addresses our needs in several key areas. These five core areas allow us to compete at the highest level, regardless of the budget gap between NU and our Big Ten peers. Providing a better student-athlete experience is critical to our success, and we need your help to ensure that continues. Over the past four years, we have increased the number of academic counselors and, in turn, the support we are able to provide NU student-athletes. The increased resources for this area have resulted in record outcomes for Northwestern Athletics. Currently, Wildcats student-athletes boast a combined 3.32 GPA and lead the nation in academic success. Northwestern sports medicine is at the forefront of medical care within intercollegiate athletics. Through technology advances, we are doing more to protect our student-athletes. From improved equipment such as helmets and shoulder pads for football, to GPS tracking equipment and software, we are working to make sure each student-athlete is as safe as possible and able to return to competition as quickly as possible in the event they are injured. The sports nutrition program is committed to helping student-athletes optimize their overall health and performance. Building sound nutrition habits helps our student-athletes achieve their athletic goals and also empowers them to maintain healthy nutrition patterns for a lifetime. By providing additional resources to fund summer school opportunities, we are able to host our student-athletes in Evanston over the summer break. This allows them to train with their teammates and our sports performance coaches while balancing their academic schedule. Providing the proper tools, training and opportunities to grow as athletes is critical to our success in the Big Ten. This area has become a strength thanks to state-of-the-art technology and methodology. Our teams have been able to develop faster during the offseason and stay healthier during the competition year thanks to increased support in this area. It is through these five areas that we are able to differentiate ourselves from our peers, attract the best talent to NU, and provide a world-class experience.